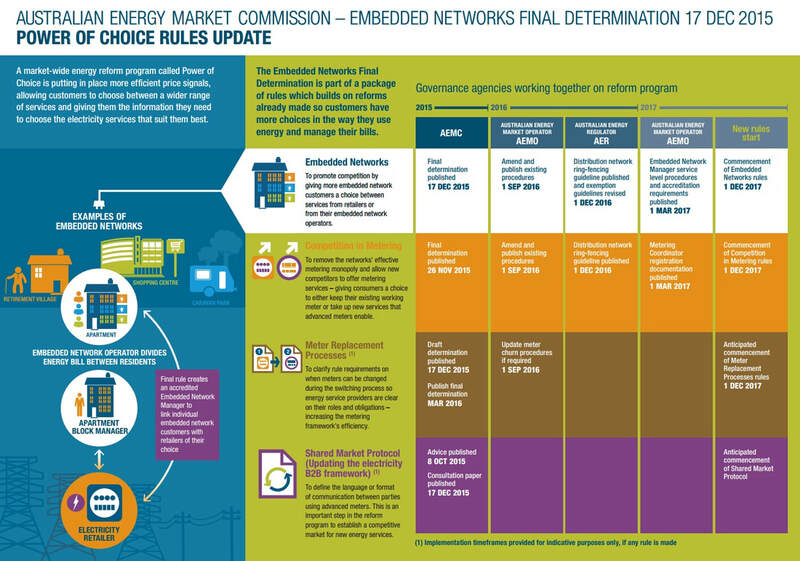 The Australian Energy Market Commission (AEMC) has introduced a new regulatory framework for embedded electrical networks which applies to residential strata sites, effective 1st December. Some strata managers who currently bill individual apartment owners for electricity in embedded networks are not compliant with the new regulation, which requires them to become an accredited "Embedded Network Manager". Embedded networks are private electricity networks which serve multiple premises and are located within, and connected to, a distribution or transmission system through a parent connection point in the National Electricity Market. 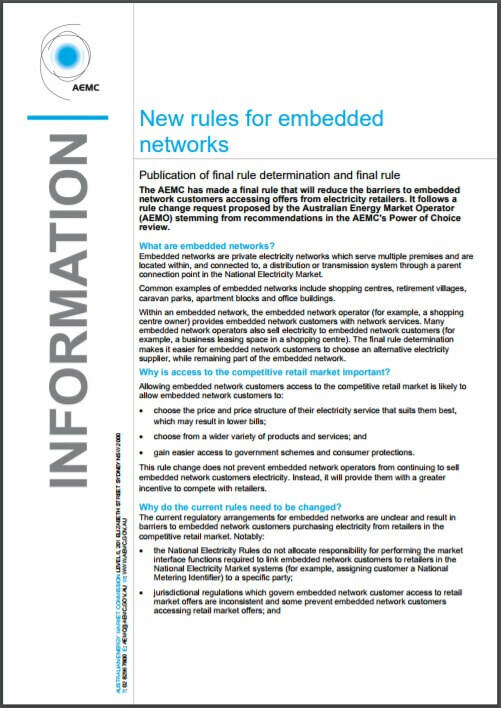 The final rule determination makes it easier for embedded network customers to choose an alternative electricity supplier, while remaining part of the embedded network. According to the report, the rule change does not prevent Embedded Network Operators (ENOs) from continuing to sell embedded network customers electricity. Instead, it will provide them with a greater incentive to compete with retailers. 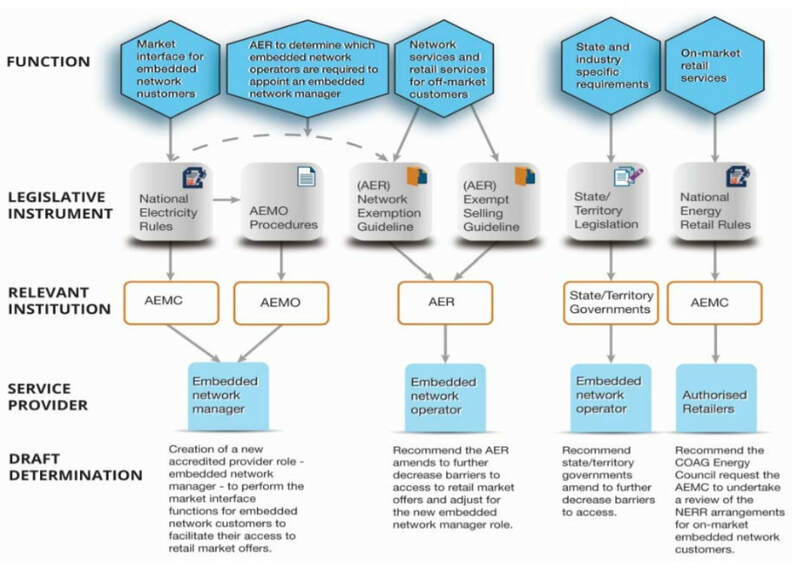 The new legislation establishes a new accredited provider role, an Embedded Network Manager (ENM), which will perform the market interface functions that link embedded network customers to the National Electricity Market systems. An online tool has been set up to assist in determining which Embedded Network Operators are required to appoint an Embedded Network Manager. This rule change is part of a reform program identified by the 2012 AEMC Power of Choice Review. This review sets out a market-wide reform program to give electricity consumers more opportunities to understand and take control their electricity use and costs. 1 December 2017. This will take effect in Victoria, NSW and South Australia. Application in Queensland, Tasmania and the ACT is expected to follow. ​For further information about the new regulations try the AEMC website. There is also an online tool and you can download the information update and the infographic. ​Strata Energy News has previously covered embedded networks in strata with Power of Choice and Stratas Profit from Prosumer Market. Wattblock is assisting strata managers to navigate the new rules. Reach out if you need assistance.